I have had a recurring nightmare for some time now. I don’t even have to sleep to have these ghostly spectres appear before me. They are the ghosts of Christmas Future. Boris Johnson has become Prime Minister after a Brexit vote. He is so dependent on Nigel Farage, looking like a smirking Toad of Toad Hall on a bad day, that they are linked at the hip. And Donald Trump has been elected President of the United States. 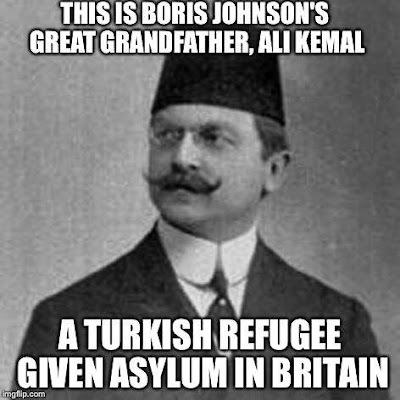 Boris Johnson is the great-grandson of Ali Kemal (1867-1922), a newspaper editor and politician in the dying days of the Ottoman Empire, who got on the wrong side of Mustafa Kemal Atatürk. Large parts of Turkey were occupied by Britain after World War I. Ali Kemal, who was Minister of the Interior in what was effectively a puppet government, made the mistake of outlawing the man who would go on to become the founding father of modern Turkey. In 1922, after the nationalist victory, Kemal was assassinated. Ali Kemal’s first wife, Winifred Brun, was an Anglo-Swiss woman. They met in Switzerland and were married in Paddington in 1903. From 1909, when Sultan Abdul Hamid II was overthrown in a coup, Ali Kemal lived in England as a political refuge Winifred died later that year after giving birth in Bournemouth to Boris’s grandfather, Osman Wilfred Kenal. Ali Kemal returned to Constantinople in 1912, and after World War I he was Minister of the Interior in the government of Damat Ferid Pasha, Grand Vizier of the Ottoman Empire, for three months in 1919. On 4 November 1922, Ali Kemal was kidnapped in a barber shop and was about to be charged with treason. Instead, on 6 November 1922, he was attacked by a mob led by General Nureddin Pasha, a supporter of Atatürk. Ali Kemal was attacked with sticks, stones and knives, and then hanged from a tree. Ali Kemal’s son and daughter who were living in England adopted their maternal grandmother’s family name, Johnson, and his son Osman also began to use his middle name, calling himself Wilfred ‘Johnny’ Johnson. But Boris Johnson was actually born in the Clinic, a hospital on the Upper East Side of Manhattan in New York, and he also has German ancestry, which is hinted at in his full name is Alexander Boris de Pfeffel Johnson. Wilfred Johnson’s wife, Irene Wiliams, was a daughter of Stanley Williams of Bromley, Kent, and his wife Marie Luise, Baroness von Pfeffel, who was born in Paris in 1882. Her father, Hubert, Baron von Pfeffel, who was born in Munich in 1843, was descended from German and Russian nobility and royalty. Boris Johnson’s mother, Charlotte, is the daughter of barrister Sir James Fawcett (1913-1991), a barrister and the president of the European Commission for Human Rights from 1972 to 1981. Her American grandparents were Elias Avery Lowe (1879-1969), a palaeographer of Russian Jewish descent, and Helen Tracy Lowe-Porter (1876-1973), a Princeton-based playwright and translator who translated the works of the German writer Thomas Mann, including Death in Venice. The world premiere of her play Abdication was produced by Hilton Edwards with Micheal Mac Liammoir’s Gate Theatre company in Dublin in 1948. Perhaps this colourful, multi-ethnic, multi-national background helps to explain why Boris once advocated Turkey’s membership of the EU. Today, however, he opposes visa-free travel for Turks to the UK, as promised under the shaky EU-Turkey deal on refugees. “His own grandfather wouldn’t have been able to come to the UK,” Sinan Kuneralp, one of Boris Johnson’s Turkish cousins, told The Irish Times in a recent interview. The Turkish side of the family is known for being enthusiastically pro-European. Sinan’s late father was one of Turkey’s most distinguished ambassadors, serving in Berne, London and Madrid. Sinan’s brother, also an ambassador, was at one time responsible for negotiating Turkey’s entry to the EU. So, “strictly speaking,” is Boris Johnson actually Boris Kemal? Despite a host of interviews over the past decade and a supposedly tell-all autobiography, Nigel Farage has yet to give them a full account of himself. Farage’s first wife is an Irish nurse: in 1988, he married Gráinne Hayes. They were married in 1988, had two children and divorced in 1997. His second wife, who is also his secretary, is German national: in 1999 he married Kirsten Mehr from Hamburg, and they have two children. As his secretary, she is paid a salary by the European Parliament of more than £27,000. A Brexit vote would, curiouly, cut off that source of income. It is among the great contradictions that while the UKIP leader rails against Europeans ‘coming over here’ and taking jobs, homes and public services, he has married women from Ireland and Germany who could move Britain under the very rules which he wants to tear up. He is loath too to speak about the fact that he is descended from immigrants. Farage himself says his surname is of Huguenot origin. The Huguenots were Protestant refugees who fled religious persecution in France. As many as 500,000 Huguenots fled France in the late 16th and early 17th Centuries, many of them settling in Britain. A report in the Daily Mail, which has since been dismissed by many genealogists as a fabrication, claimed Farage is a descendant of Georgius Ferauge, from Fumay in the Ardennes, which straddles today’s border between France and Belgium. The report said Georgius Ferauge was Nigel Farage’s great-great-great-great-great-great-grandfather, was born in Fumay in 1681 and emigrated to Swallowfield, in Berkshire, in the early 1700s. There his family found no border controls, no immigration policy, no racial or religious prejudice. Instead, they found a peaceful country that welcomed them and encouraged them to make the best of their lives. Over the years, the name Ferauge was anglicised to Ferridge and then to Farage. It was a good story, even if has since been disproved. But it has been proved that Nigel Farage has Irish ancestry: his great-grandparents were Daniel Savory Farage and Lucy Susannah Moynihan (1858-1932). A recent investigation by the Mail on Sunday also revealed that Farage’s grandmother, born Gladys Schrod, is descended from German immigrants who fled to Britain in search of work and a better way of life. Despite many interviews, Farage never refers to his German ancestry and his German ancestors are not mentioned in his self-congratulatory memoirs Flying Free. Farage’s great-grandfather, Carl Schrod, was a German-born Post Office sorter who lived in rented rooms in the German quarter of London behind Tottenham Court Road – an area that was familiar to refugees and prostitutes. In the mid-19th century, religious persecution was rife throughout Germany, there was a sharp downturn in the economy, and rising land prices were driving people out of Germany. Nikolaus Schrod, Farage’s great-great-grandfather, was a young cabinet-maker in Frankfurt. He married his sweetheart Bina, and they soon decided life would be better if they fled. The British Government of the day operated what was effectively an open-door policy on immigrants, and then, as now, migrants saw England as a land of promise. Nikolaus Schrod made cases for pianos, while Bina worked as a needlewoman and dressmaker. They lived in rented rooms in the teeming tenements of London, on a minimum wage and in near-poverty, and became the very models of how foreign labour can add to the wealth of the nation. Their only child, Carl, left school at 14 to become a telegraph messenger with the GPO. He later changed his name to Charles and married an English girl, Ellen Abbott. The Anglicisation of the family was completed in the next generation when their daughter Gladys married a young stockbroker’s clerk, Harry Farage. Meanwhile, research by an academic at Aston University shows that despite his tirades against Mexican migrant and Syrian refugees, Donald Trump’s grandfather was an illegal migrant. The Republican candidate has claimed Mexicans are ‘bringing drugs, crime and rapists’ into the US and that Syrian refugees are terrorist ‘Trojan horses.’ He has suggested building a wall along the Mexican-US border to stop migrants. Dr Stefan Manz, a Reader in German at Aston University, has published extensively on the history of German emigration. His research shows that Trump’s grandfather, Friedrich Trump (1869-1918), lived a migrant life in the US on the edge of illegality and rejection. Donald Trump’s father, Fred Trump, later denied his German heritage, and claimed Grandfather Trump was from Karlstad in Sweden. In fact, he was Friedrich Trumpf from Kallstadt in Germany, and the family name was originally Drumpf. When Friedrich Trumpf, alias Trump, moved from Germany to New York in 1885, he was one of 1.8 million Germans to emigrate during the 1880s and 1890s in waves of mass migration. After working for six years as a barber – which hardly explains Donald Trump’s hairstyle – Friedrich Trump was caught up in the Gold Rush, moved west and opened up a chain of restaurants, hotels and brothels in Washington State and British Columbia, selling hospitality that included food and lodging, alcohol and prostitutes. By 1901, he had made a small fortune and planned to return to go back to Germany. 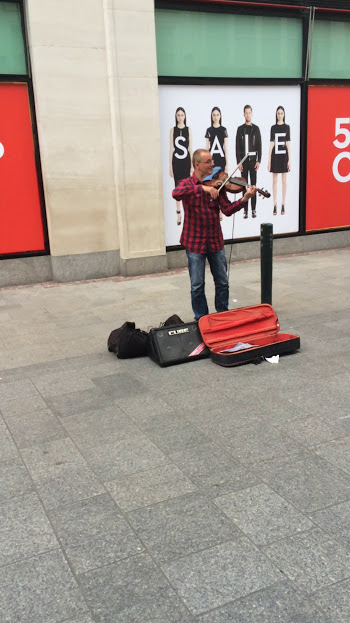 But the German authorities would not let him back. They claimed Friedrich had left the country as an illegal emigrant, evading taxes and conscription. Trump and his family were thrown out of Germany and he returned to New York. Later, during World War I, German-Americans were often labelled as alien enemies, suspected of being spies and saboteurs, and a dangerous mix of paranoia and xenophobia was directed against German-Americans. The Alien Enemy Bureau was set up to track down and arrest disloyal foreigners. It was headed by J. Edgar Hoover, who later became director of the FBI. Dr Manz of Aston University says: “Trump’s own grandfather was an illegal emigrant whose income stream included alcohol and prostitution at a time when these were legally contested. He was an unwanted returnee to Germany, and then a potential ‘enemy alien’ within the United States who had declared his loyalty to the German Kaiser – but ultimately made an immense economic contribution spanning generations. UKIP launched a nasty poster last week that showed frightened, fear-filled refugees, queueing in masses, but with the caption: “Breaking Point.” Many bloggers and other posters on social media have pointed to the poster’s similarity to Nazi propaganda footage of migrants shown in a BBC documentary in 2005. 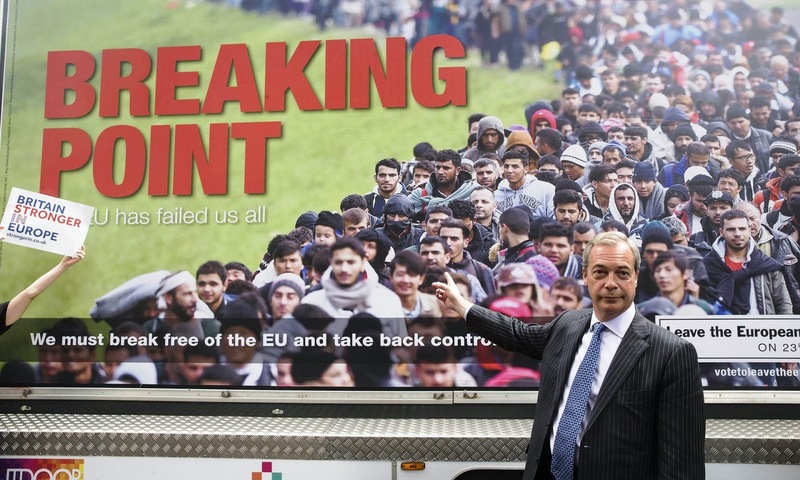 In some photographs, Farage is pointing at individual frightened refuges in the queue, some of them children. Had this photograph been taken a few decades ago, a few centuries ago, he might be pointing at one of his own ancestors, or an ancestor of Boris Johnson, or an ancestor of Donald Trump. I rejoice in difference in my background and family story. One grandfather, Stephen Edward Comerford (1867-1921), contracted malaria in Thessaloniki, and by a peculiar set of coincidences without this tragedy I would not have been born. My other grandfather, Thomas Michael Murphy (1881-1947), lived in Australia and is buried in Mackay, Queensland. I am happy to celebrate the diversity of my Comerford family background in Ireland and in England. I have written many times of how members of the Comerford family first found safe havens in France and Spain in the 17th and 18th centuries and soon prospered. I have cousins in the US and Argentina, and members of the Comerford family live on all continents … apart from Antarctica. I rejoice in political difference and robust debate, I am not a member of any political party, and I only share my party political preferences with close friends and family members … when they ask. But I fear that the world is hurtling towards a more dangerous place than it occupied at the height of the Cold War. If you have a vote in the British referendum on Thursday [23 June 2016], please do not let bigotry, racism and isolationism triumph. If you have a vote in the American presidential election, please do not let hatred and bigotry trump justice and mercy. The ghosts of our past and our present can always haunt our futures. What if the Mediterranean was a little closer to Ireland? But what if the Mediterranean moved a little closer to Ireland? Monday [20 June 2016] was World Refugee Day, and I wondered what “strokes” do our politicians need to pull to place the refugee crisis in the Mediterranean higher on the European priority list? The United Nations General Assembly proclaimed World Refugee Day from 20 June 2001 on because that day marked the 50th anniversary of the 1951 Convention on the Status of Refugees. To marked World Refugee Day in Dublin, I took part in a street protest in Dublin supported by United Against Racism, Amnesty International, the Irish Anti-War Movement and other groups. We don’t have space: There are over 250,000 empty homes in Ireland. What about our own? One-in-six people born in Ireland lives abroad, the world looks after our own … go figure that one. They’re not real refugees, they have smartphones: refugees are fleeing persecution, not poverty. Can’t they go somewhere else? They do. There are 1.9 million Syrian programme refugees in Turkey, 600,000 in Jordan, 1.2 million in Lebanon … and 210 in Ireland. Refugees = ISIS: ISIS? In a dinghy? You must be joking. They’d fly with forged papers. Why are there so many men? They risk the journey first to pay for their families’ safe journey later. Providing rescue attracts more refugees: They must and will flee, whether we help or not. The UN refugee agency released a report yesterday saying that the number of refugees and internally displaced people worldwide stood at 65.3 million at the end of last year. The record number is because persecution and conflict in places like Syria and Afghanistan have led to an increase in their numbers. To mark World Refugee Day, the aid agency GOAL released six interesting facts about refugees. 1. More than half of the world’s refugees are children. 2. Albert Einstein and Sigmund Freud were refugees, along with music artists MIA, Wyclef Jean and the Dalai Lama. The Dalai Lama, who was forced to flee Tibet at a young age, remains a refugee. 3. Most refugees live in cities, not camps. About 25% of the world’s refugee population live in camps but many more live in cities, where most pay rent. Many refugees end up living in slums and informal settlements on the fringes of cities, where conditions are often difficult and hazardous. 4. More people are displaced today than any time since World War II. For the first time since World War II, the number of refugees, asylum-seekers and internally displaced people worldwide has exceeded 50 million people. Every day, more than 40,000 people worldwide are forced to flee their homes. This is equivalent to the population of Longford. While more than one million migrants crossed into Europe in 2015, an overwhelming 86% of refugees are hosted by developing countries. 5. The contraceptive pill, fish and chips, the mini, and Sriracha, the hot sauce with a cult following, were all invented by refugees. The key ingredient for the contraceptive pill was developed by Carl Djerassi, an Austrian refugee. Jewish refugees fleeing persecution in Portugal in the 17th century brought fish and chips to Britain. The Greek refugee who created the iconic Mini, Sir Alec Issigonis, fled from Turkey in 1922. 6. Syria was the world’s second-largest refugee hosting country before war broke out in 2011. Today Syria is the largest refugee producing country in the world, with a staggering 4.2 million refugees. The crisis has been raging for over five years, resulting in the internal displacement of 7.6 million people. An average of one bomb a day fell on the province of Idlib in northern Syria in October, an area about the size of Galway. Later, as I walked down Grafton Street, a busker opposite Marks and Spencer was playing the haunting theme music from Schindler’s List, and I wondered what has changed over 75 years and what have we learned since then.